BCAC offers a variety of ‘OUTREACH’ or ‘EXTENDED STUDY’ study programs, especially to international and national plus schools from around the Asia Pacific region and from around the world. These programs are multi-disciplinary with a combination of activities in different areas such as Eco-environmental Studies, Community Service – the Culture, History, Religions and way of life of the Balinese and so on. 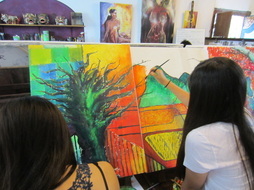 At BCAC; Artistic Creativity is the catalyst that binds all the experiences and information students gain together holistically. We guide and assist students in keeping on-going journals to record their experiences and what they have learned. This is planned in close liaise with schools to ensure program content is relevant to schools’ particular vision and philosophy and curricular. Social or Community Service: some form of social or community service component is an extremely popular option and a recommended feature for these programs. Global Awareness and Environmental Sustainability: is a burning issue today that most school systems feel morally and ethically bound to address. This too is a very popular choice. Entry to performances, museums, gallery’s etc. Preferred dates (length of program. Allow 1 day each for arrival/departure. Preferred additional educational and/recreational activities. Watch this video of the Australian International School, Singapore on their Week Without Walls Program. The students participated in a range of artistic and culture based activities for several days learning how to make Batik, Cycling from Mt. 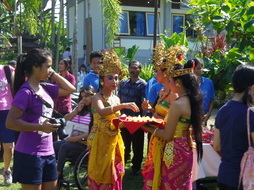 Batur, creating Balinese offerings and much more. See videos from various other schools Week Without Wall's programs by clicking the photos below.